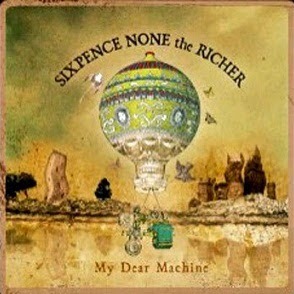 I just discovered an extremely informative interview with Matt Slocum and Leigh Nash of Sixpence None the Richer. You can read it here. It is by far the best and most concrete info you are going to find about their new album, Strange Conversation, online. Matt is also more outspoken than he has ever been about their music. There is no mention of a release date, although some places online state August 24. I would say that is doubtful, but you should expect to have it in your hands by the end of 2010. More about this album from Billboard. UPDATE (July 24, 2012). I posted this exactly two years ago. It is far and away the most viewed post on my blog in the 10 years my blog has existed. I have no idea why, because there is so little content. If you want more info regarding this album, which has since been re-titled "Lost in Transition", I encourage you to read the open letter to the band I wrote a couple months ago. UPDATE (May 3, 2015). This is still far and away the most-viewed post in the history of my blog. I fear the interview it links to is going to disappear, so I am copying and pasting it into this post. Also, read my in-depth oral history of This Beautiful Mess that I published on it's 20th Anniversary, April 18, 2015. It features 8 interviews, including the 5 members of the band in 1995. In 1992 Matt Slocum and Leigh Nash started their musical journey in their home town of New Braunfels, Texas. Inspired by the great author C.S. Lewis and his classic book, Mere Christianity, Slocum dubbed the project Sixpence None the Richer. Additional musicians were gathered. Low budget, but spirited records were assembled, and a small, devoted cadre of fans began to discover this graceful, dynamic and eloquent little band. A few hundred concerts and a few band members later Sixpence landed a deal with Nashville label Squint Entertainment, an imprint of Warner Brothers. Their 1997 self-titled album came, almost literally, out of nowhere to earn a Grammy nomination, a Dove Award and widespread critical acclaim, as its lead single “Kiss Me” dominated radio charts, reaching the #1 spot in ten countries and achieving absolute ubiquity in the US. From church basements and white cargo vans to David Letterman, MTV and the top of the Billboard charts in a short six years. It’s the kind of long slow overnight success that kills most artists. Sixpence was no exception. In 2004, after scoring three additional radio hits and having their songs land in major films and ad campaigns, Slocum and Nash packed up the tent and shut down the show. Slocum started a new progressive pop group called The Astronaut Pushers and became a sought after cellist in the Nashville music scene. Nash began a solo career and focused on developing her songwriting skills with some of the biggest names in the business. Though the repercussions of their foray into the pop stratosphere included significant personal pain and brokenness, in time real life came back into focus. Then in 2007 Slocum started thinking that maybe it was time to dip his toe back into the water. “Maybe we should have called it a hiatus instead of just breaking up,” he says. After the digital release of their independent EP, My Dear Machine, the band started to perform live, both around Nashville and at festivals, and on small tours around the world. They followed with 2008’s independently released Christmas LP The Dawn of Grace. After months of writing, Slocum and Nash spent a considerable amount of time considering who they would tap to produce the new record. “We really stressed out about the producer,” Slocum admits, “because we knew it was such a crucial decision. We knew that we needed somebody that would really take the reigns and push us… to not let us fall into what we would just sort of naturally do. We wanted to pick somebody we could really trust.” On their dream list was the legendary Jim Scott, the much celebrated genius behind Wilco’s albums, a favorite of both Slocum and Nash, as well as many of the most important records of the last 30 years. “I knew Jim Scott,” Slocum says, “but I had no idea how many records he had worked on. It turns out his discography was pretty much my listening experience from about sixth grade on.” Names like Johnny Cash, Tom Petty, Red Hot Chili Peppers, Foo Fighters, Cracker and a few more obscure faith-fueled artists that influenced Slocum early on, like Tonio K. and Vigilantes of Love rocketed Scott to the top of their list. They met, and Jim enthusiastically agreed to produce the album. Nash enjoyed the experience so much, she didn’t want it to end. “If things ever got tense or frustrated we just took a break,” she adds. “And the way they built the tracks around my vocals was just wonderful. We’ve never done it that way. And every instrumental track is so tasty. There are no wasted parts.” On her last day of recording, she literally broke down. “When we left on the last night we were driving away and I completely lost it. I was bawling like a baby. I love him. He’s amazing.” In the end both Slocum and Nash agree that Jim Scott not only captured their best performances, he helped them re-connect with what they love most about making music. The resulting tracks unfold as pure Sixpence; melancholy mixed with romance; pain wrapped up in grace. Themes of brokenness, confusion and failure amble around encouraging words and pleas for mercy. The opening song, “Radio,” captures a perfectly catchy pop melody as it tells the story of an estranged couple hearing “their song” on the radio and processing the flood of memories the tune elicits. “I think everyone can relate to that situation,” Slocum says, “but that probably won’t happen too much anymore. Radio doesn’t have the same kind of impact it once had. Everyone has their own little world going on.” Between its nostalgia and its beautiful sadness, “Radio” has all the makings of a hit. On “Give It Back” the singer pleads with God to restore what once was. “If you’ll blow on the ember, the light will shine on my face, the streams will run in the desert, and sing Amazing Grace.” Slocum admits that the sentiment is personal and not abstract. “It’s a plea with God saying ‘I used to have this thing that you blessed me with and it’s gone away by your choice or whoever’s choice and I’d like to get it back.’” The prayer seems to be answered as the rest of the songs unfold. Never has Sixpence sounded this confident, elegant or poised. Slocum admits that he is more a fan of Nash’s songwriting than ever. “I really loved Leigh’s solo record,” he says. “I thought she did a great job. It felt like her writing skills had really blossomed in that process.” Nash contributes more songs to this collection than she ever did on any of the band’s previous efforts. The shimmering but sad “Go Your Way” explores the somewhat disturbing idea that a particular couple can decide to stay together or walk away. “Should Not Be This Hard” articulates a frustrated observation about the difficulty of human relationships, and “Sooner Than Later” observes a failed relationship through eyes of grace. All told Nash wrote on half of the album’s tracks.